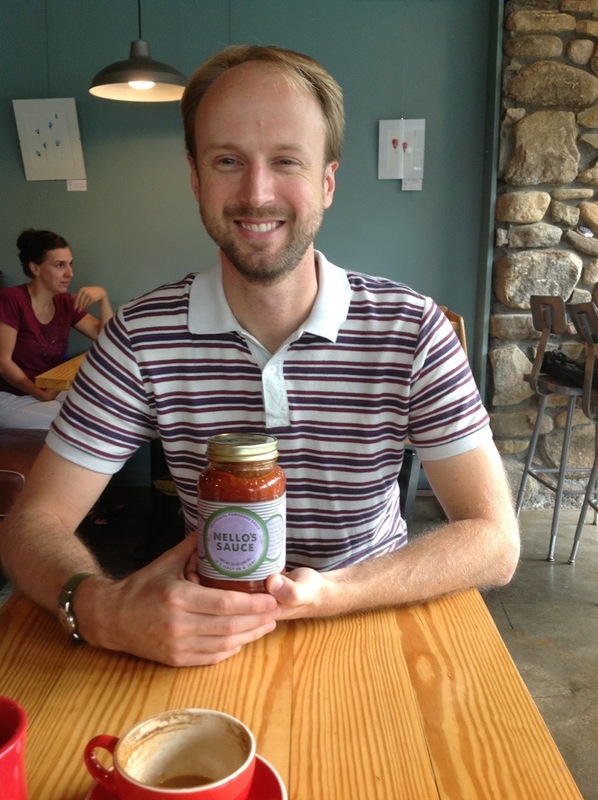 Neal McTighe of Nello’s Sauce shared his experience developing a local, food-based business! The area where I live in central North Carolina is teeming with men and women who are dedicated to bringing people fresh, high quality, locally produced food and improving access to healthy foods. This desire to connect people to good, healthy food has spawned a myriad of small businesses, and I’ll be taking some time to interview them and share what I find about why they do what they do and how they do it. The first person I met with is Neal “Nello” McTighe, founder of Nello’s Sauce. Nello’s Sauce is based in Raleigh, and is rapidly becoming available at grocery stores across North Carolina. If enthusiasm is a contributing factor to entrepreneurial success, Nello’s Sauce is on its way to greatness. The journey to Nello’s Sauce began with a college study abroad in Italy that inspired McTighe to help others learn about Italy and Italian culture. Over successive trips to Italy and by studying his own family history, McTighe absorbed everything he could about Italian history and culture. While working a regular 9-5 job, he began (as many of us do) to share his passion for Italy through a blog about Italian culture and cooking. Eventually, he found a wonderful opportunity to teach Italian at a local college. Fortuitously, this new career also gave him the flexibility to begin a new, Italy-focused business. As McTighe continued exploring Italian cuisine, he developed a reputation among his friends as a most righteous pizza maker. Hmmm…could pizza be his calling? He did some initial feasibility studies, and found that the complexity of making, freezing, delivering and selling frozen pizzas did not bode well for a young startup business. Focusing on one component of that dish–the sauce–had better possibilities and fewer supply chain issues. McTighe began testing and experimenting with the sauces he already loved to make, and Nello’s Sauce was born! Every new journey begins with a great deal of learning, and starting a food-based business is no exception. Nello’s Sauce started in McTighe’s kitchen, where he hand-crafted and canned batches of his tomato sauce. He stressed to me the importance of thinking through every detail–How much will ingredients cost per ounce or per unit? What kind of jar is best? What size will the package be? What will the label say? Where will the ingredients come from? What kind of insurance do you need? What requirements do grocery stores, farmers markets, etc have for selling your product? Where will you make your product and how? The last question is one with big implications. While Neal started creating and canning his sauces in his own kitchen, that quickly became impractical. I mean, could you fit a pallet of canning jars in your kitchen? I know I couldn’t! Leasing commercial kitchen space from a restaurant can be frustrating, inconvenient and expensive. Fortunately, Neal found a commercial kitchen in a nearby town that leases space to small, food-based entrepreneurs. The Piedmont Food and Ag Processing Center provides training, regular, convenient access to a large commercial kitchen facility plus storage for pallets of jars and lots and lots of tomatoes. 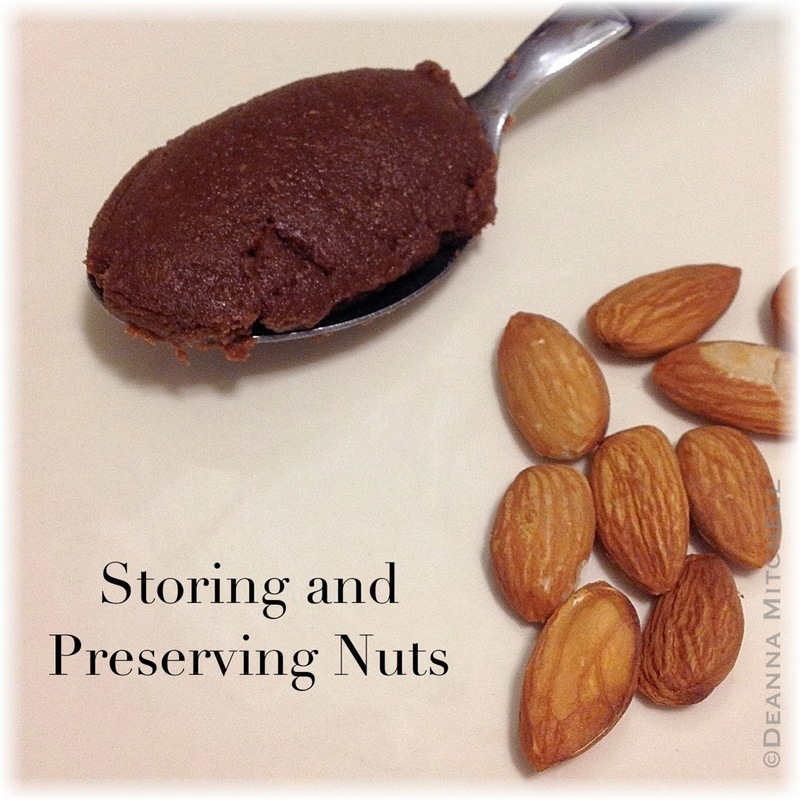 Also, understand where your ingredients will come from and how they will be cleaned and processed. If you are purchasing vegetables from local farmers, how sustainable is that if your business doubles? Triples? Blanching and peeling tomatoes for 10 quarts of sauce may be okay, but what about for 100 quarts of sauce? In the case of tomatoes, only a few big processing facilities to clean and peel tomatoes exist in the entire country, and guess what? None of them are in North Carolina. Or even in our part of the country. For McTighe, the only way to continue making his sauce locally is to purchase cleaned and peeled tomatoes from one of these large facilities (buying and shipping NC tomatoes to California for processing and sending them back to NC is only do-able if customers are willing to pay something like $20.00 per jar–in other words, NOT do-able). While his sauce is a local product from a local company, North Carolina sadly does not have the infrastructure in place to use local tomatoes. As a business owner, it’s good to have this knowledge in your back pocket, so when your business expands, you are ready. 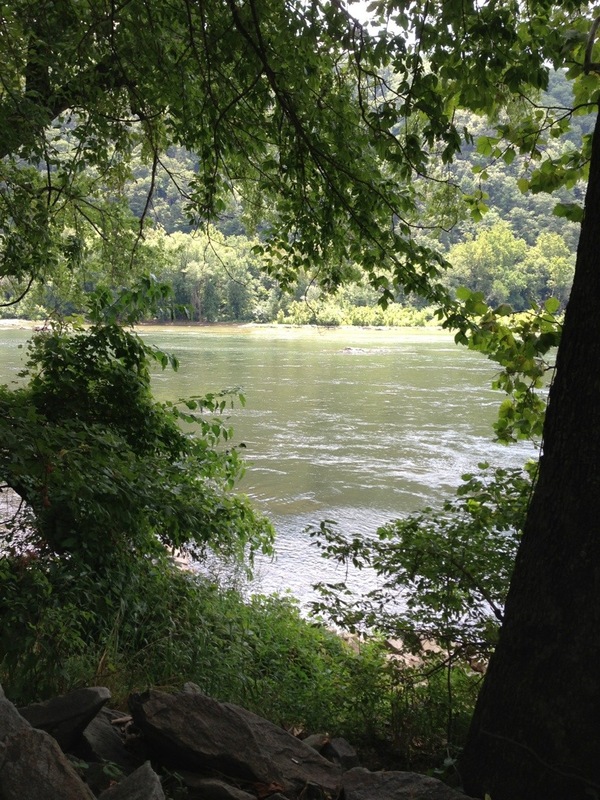 Neal would be the first to admit that he has learned a tremendous amount in the past few years–some of it through personal connections and research, and some of it the hard way. One thing he understands is that more people need to be involved in healthy, sustainable food production. And while it’s fabulous that Whole Foods is carrying Nello’s Sauce, Neal also realizes that not everyone has access to healthy food. Rather than shrugging and walking away, he came up with a plan to help. Our Hearts Beat Hunger is a two-pronged initiative to encourage young entrepreneurs and get Nello’s healthy sauce into low-income homes. Started through crowd sourcing, Our Hearts Beat Hunger raised funds to provide a mentorship opportunity for one young dreamer and donate jars of sauce to local food banks. The hope is that as the business expands, so will the philanthropy. For Nello’s, it’s not just about being a business–it’s about being part of a larger community. That spirit is what makes some of our local, food-based businesses so amazing. Thinking about starting your own business? Here are some tips from Nello! Start with what you love. You’re going to spend a LOT of time doing it, so you should have a passion from the beginning. Start small and get LOTS of feedback on your product. Ask your family. Ask your friends. Ask strangers. And then listen! Find a unique aspect to your product and go with that. Be able to communicate what separates your product from others on the market. Research every aspect of your product and process–identify supply chain issues early. Identify how you might expand your business without losing quality. You probably won’t be cooking in your own kitchen for long, so what’s next? Understand state and federal guidelines and requirements for food production, storage and labeling (most of this is available online). Requirements vary depending on the type of food and the number of units sold. Having this information upfront will help prevent unpleasant (and potentially expensive) surprises later. Grow slowly and thoughtfully, and enjoy the journey along the way. Thanks to Neal McTighe for sharing time with me to talk about Nello’s Sauce and local, food-based businesses! Click HERE for more information about Nello’s Sauce! 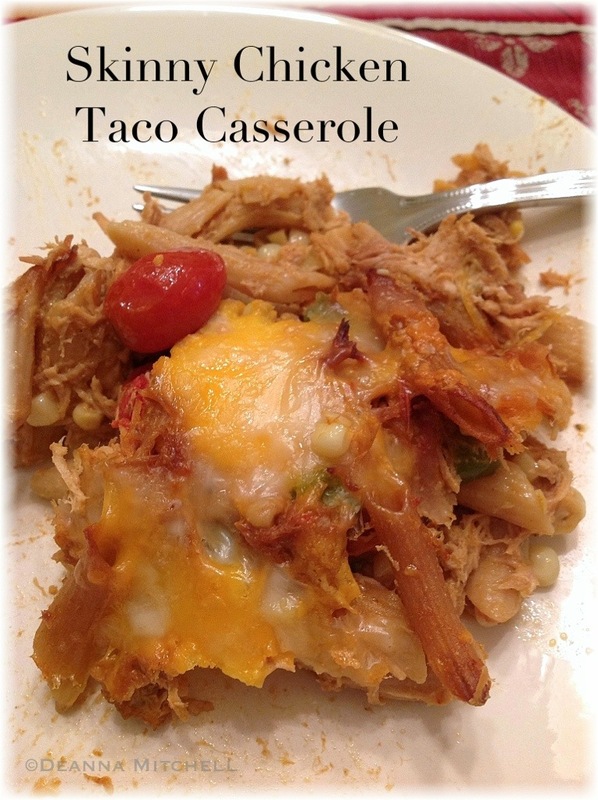 Want to see what I did with my Nello’s Sauce? Click HERE for our Aubergine and Lavender Pasta recipe! One of the great aspects of working in a downtown area is our Wednesday downtown farmer’s market. Not only can I walk down the street to do my shopping, but I can get lunch, too! I am completely in love with this Korean mixed rice bowl offered by Kim Bap (see photo above)–I may very well be addicted to the chili sauce. 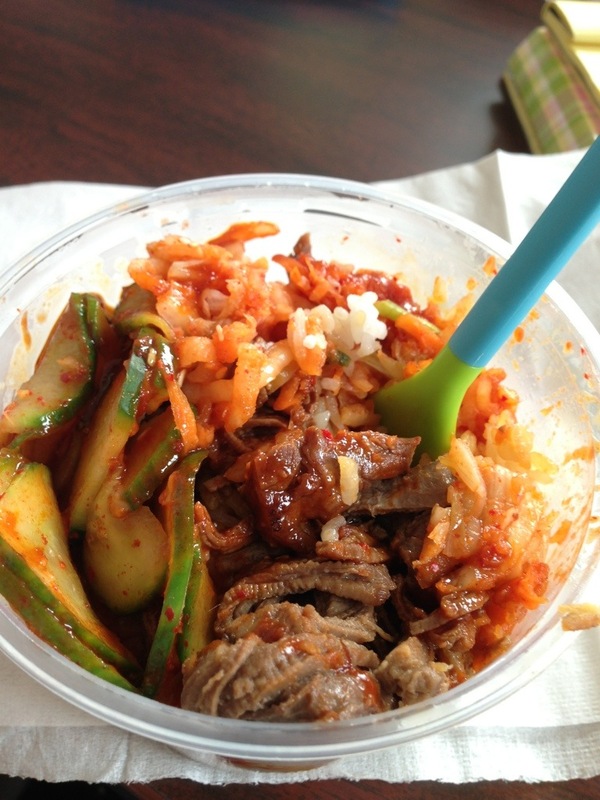 The whole bowl is filled with warm rice, brisket, kimchi, and vegetables (today it was cucumber). Yum!!! Well this week’s produce at the market was beautiful, but I can definitely see that the seasons are starting to change. The berries are gone and tomatoes and peaches are on their way out. For the first time this year, I saw muscadine and scuppernog grapes and many of our vendors have early apples. Sigh. I’m still not finished with summer, but it is clearly coming to an end. This week’s menu for Labor Day weekend features some wonderful, late summer produce like corn, bell peppers, butter beans and figs. I tried a fig and almond cake that was wonderful, but ugly. I’m going to try again and hope that the next version is more photogenic! I first saw the idea for a vegetable tian in an issue of Martha Stewart magazine many years ago. It looked hard. And fussy. I didn’t have a food processor, but I did have a little baby, and the thought of slicing all those vegetables seemed out of the question–who had the time? But things change, right? A few weeks ago, I saw another recipe on Pinterest and thought I’d give it a try. I have a trusty food processor now, making all that slicing easy. And that little baby is 13, so I can use sharp cutting tools without too much worry. Perfect timing! 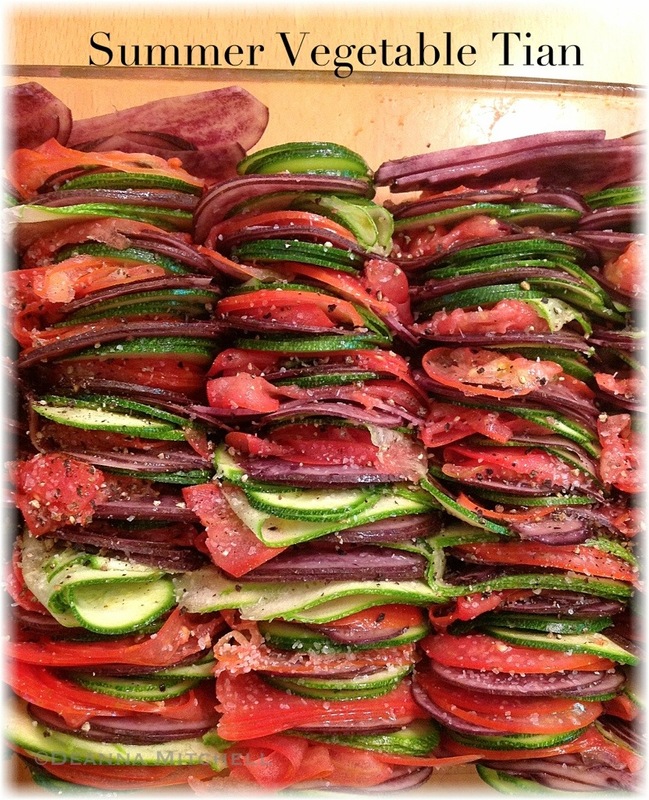 A vegetable tian is basically thinly sliced vegetables that are stacked, seasoned and roasted until tender. Then topped with some cheese and baked until melty. This is a reasonably healthy, tasty and pretty dish–perfect for a dinner party or holiday dinner since it looks so fancy. Although we had this as a side dish, it would make a terrific vegetarian entree if you subbed the Parmesan cheese for soy cheese! 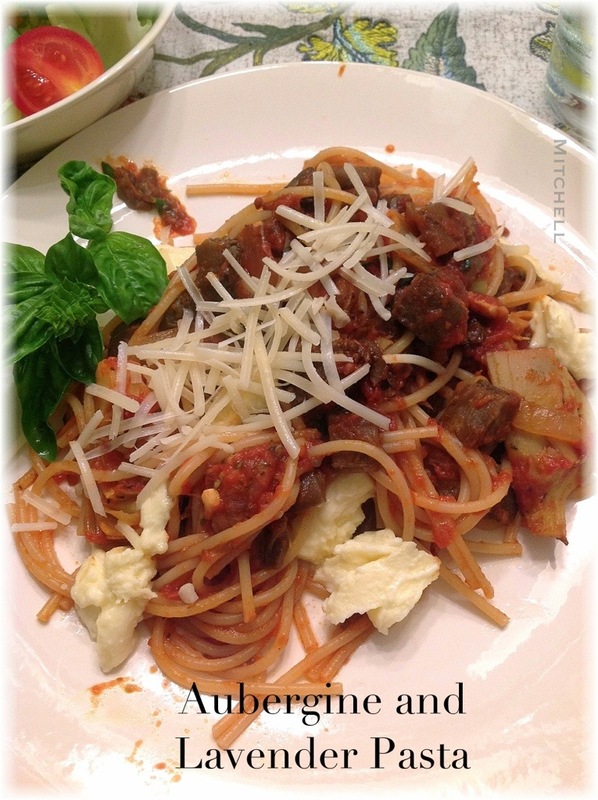 For our tian, I used late summer vegetables that I had handy–zucchini, purple potatoes and Roma tomatoes. I would have used yellow squash, but we had eaten it all. Ditto for the eggplant. The next time I make this, I’ll probably add some yellow squash and onion slices for some added flavor. And I may leave out the tomatoes since I am the only tomato fanatic in the house. You could make this with any vegetables you have handy as long as they can be sliced thin (sorry, broccoli, you’re on the sidelines for this one). Looking ahead (although I am still not finished with summer), a fall version with sweet potatoes and squash would be pretty phenomenal–maybe drizzled with maple syrup! While my “little one” isn’t so little anymore, I wonder if smaller children would love to see the animated movie Ratatouille, followed by helping to make the vegetable stacks for the pan. Maybe that would increase interest in eating vegetables??? 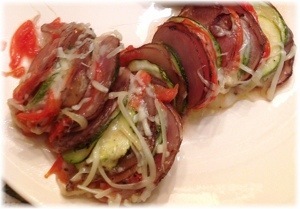 This is one dish that involves some fun and creativity in the prep work! Coat a 9 x 13 baking dish with cooking spray or oil. Slice all vegetables to equal thickness (ours were on the thinnest setting of the food processor). Arrange vegetables in stacks within the baking dish–I used a little pattern, but you could be random–whatever works for you. When all your vegetables are safely tucked in, drizzle with olive oil and sprinkle generously with salt and pepper. Cover and roast for about 30-40 minutes. Vegetables should be soft. Uncover, top with cheese and bake for another 15 minutes. Lavender. In pasta. You heard me! This pasta features some fresh, local vegetables and a locally produced pasta sauce with lavender. Game on, fellow foodies. I recently had the pleasure of meeting Neal “Nello” McTighe, owner of Raleigh-based Nello’s Sauce (a post about Nello’s is coming up later this week!). You know, we don’t purchase much in the way of processed or prepared foods, but I was very interested in talking to the folks at Nello’s about starting a small, local business. And, I like food, right? 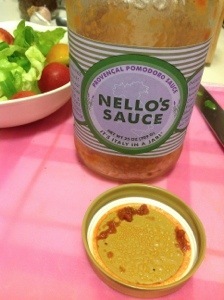 During a recent blogy interview, Neal introduced me to Nello’s newest creation, their Provencal Pomodoro Sauce. Yes, Provencal–as in Provence, France–home of lovely fields of lavender! The amazing ingredient in this particular sauce is organic lavender. Now, I’ve had lavender in pound cake and cookies and in Herbes de Provence, but it never occurred to me to use it in a tomato sauce. Nope. Not even once. Shame on me, right? Since we have loads and loads of fresh, ripe eggplant at our farmer’s markets right now, I decided to take this sauce out for a spin with a roasted eggplant, chicken and artichoke heart pasta, created on the fly using what I found at the market. I used some locally produced fresh mozzarella, which melted oh so deliciously into the sauce. This recipe is a keeper, for sure. It was definitely on the hearty end of the food spectrum, although it is very modest in calories and super low in fat. You could easily skip the chicken, increase the eggplant and Voila! 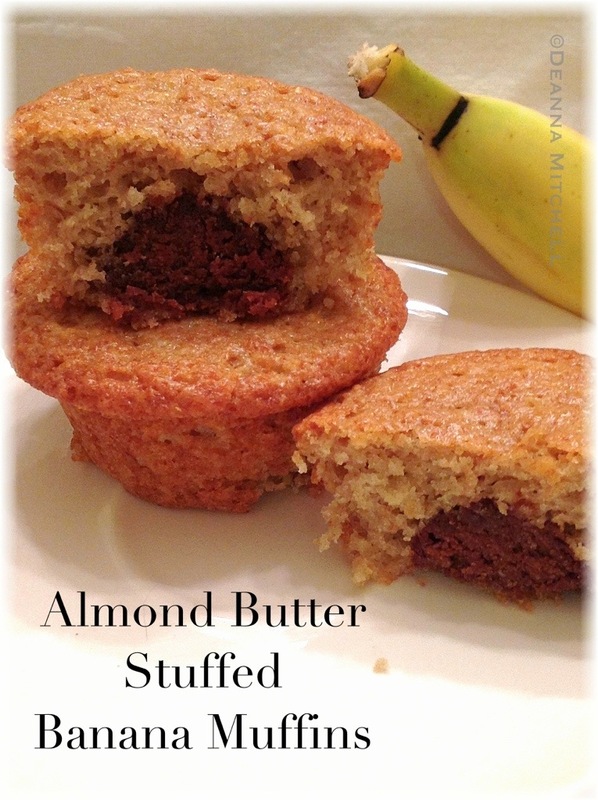 Meatless Monday! I should disclose that the sauce was given to me, although without expectation that I would blog about it. Although it was a gift, I would not blog about it if it weren’t exceptional–I have too many pieces to write as it is, so I’m not going to write about something that isn’t good. Ain’t no blogger got time for that. A note about the sauce. If you have picky eaters and are worried about lavender in the pasta sauce, here is my suggestion–don’t tell them.The lavender in the sauce adds a lovely, floral flavor that doesn’t overwhelm you (you won’t feel like you are eating potpourri), and your family probably won’t be able to place the wonderful flavor. It is really a winning combination! Nello’s Sauce is available at central NC Whole Foods stores or HERE. Neal is running a contest this week for recipes using his sauce–you can find information on the Nello’s website HERE. Put a stock pot of water on to boil for the pasta. Line two rimmed baking sheets with foil. In a medium bowl, combine the cubed, raw chicken with 1 tablespoon of olive oil, pinch of salt, pepper and the Herbes de Provence. Toss well and add to one rimmed baking sheet. Put in the oven and roast for 35-40 minutes. In another bowl, combine cubed eggplant and 1 tablespoon of the olive oil, and toss well to coat the eggplant. Add to the second baking sheet and roast eggplant for 30 minutes or until soft (I added the second baking sheet about 10 minutes after the chicken, so they finished at the same time). In a 12″ skillet, heat the remaining olive oil over medium heat and saute the onions until they are soft and begin to caramelize, about 8 minutes. Don’t let them burn. Add the garlic and artichoke hearts and cook another 2-3 minutes. Add the pasta sauce and reduce heat to medium low. Put the pasta in the boiling, salted pasta water and cook according to directions. While pasta is cooking, add the cooked chicken and eggplant to the sauce. Stir well. Cut up the basil leaves and add to the sauce. Drain the pasta, reserving 1/2 cup of the pasta water to thicken the sauce, if necessary. Add the drained, cooked pasta to the skillet with the sauce. Turn the heat off, and use tongs to combine the pasta and sauce. Serve the hot pasta with chunks of fresh mozzarella and Parmesan cheese, if you like (and I do!). I am not letting go of summer yet, no way! Summer used to yawn out in front of me like a vast, open stretch of beach sand–lazy days, melty ice cream, the smell of cocoa butter and pool chlorine, and sweaty games of kick-the-can until late in the evening. And even a bit of boredom. This hazy, melty kind of summer stopped a long time ago for me. At some point it was replaced by status meetings, family schedules and concerns about skin cancer. What the whaaaaaat??? Now that I’m approaching 50, I definitely have a sense that time is speeding up. Months and years are whipping by and I find myself asking things like “How could summer be over…AGAIN?” Seriously. Where in the world did summer go? I can’t find my favorite sun screen at Target anymore, but I could go on Pinterest today and download 50 recipes for pumpkin. It is August. That is wrong, people. I want my summer back. So I am making a stand. I refuse to let summer go, and will live in denial until I have had my fill of popsicles, grilled hamburgers, days by the pool and hot pink nail polish. I will not wear boots, no matter how cute they are and I will keep my flip flops by the door as a reminder not to give in. And no…I repeat NO…pumpkin bread, pumpkin pie, pumpkin protein bars, pumpkin oatmeal or pumpkin ice cream until late September. Ok, maybe pumpkin ice cream… Still. Summer, I am not done with you yet. 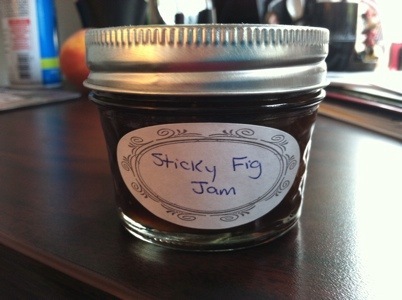 I have 4,264 summer recipes left to try, and about 600 canning jars still to fill. I need to ride my bike. And paddle my kayak. And make s’mores. And eat tomatoes. Lots and lots of tomatoes. So here is my menu of summer goodness to celebrate summer, even though Target probably has Halloween costumes crowding out the school supplies. And if anyone knows of a way to filter out “pumpkin” from Pinterest, I’ll be glad to know it. I don’t know who came up with the BLT sandwich, but they are geniuses. I love a great BLT, especially when heirloom tomatoes are fresh and ripe and we have great, fresh bread handy. Yum! In the absence of bread (or if you are trying to avoid bread), a BLT salad makes a delicious meal. This salad started off as a BLT salad, with bacon, lettuce and tomato. Unfortunately, the “bacon” I received in my produce box last week was actually a cured side meat known here as “streak o’ lean”– meaning mostly fat, with a little streak of lean meat running through it. Now side meat is awesome for seasoning kale, collards, beans and lots of things, but it is not a replacement for bacon–especially in a salad. Had I known what I was getting, I would have stopped by Mae Farm and picked up some of their incredibly awesome bacon. Instead I lightly fried some prosciutto we already had and used that. I think I actually like the prosciutto better on a salad–it is light and very crunchy and has tons of flavor without all the fat of bacon. Score! Put eggs in a small pot and fill the pot with water to cover eggs by 1″. Cover and heat eggs over high heat until water boils. When water comes to a boil, shut off heat and let eggs sit for 12 minutes. While eggs cook, heat a small frying pan over medium heat. Add prosciutto slices and cook until crispy, about 4 minutes per side. Remove to a paper towel to cool and drain. Wash, trim and chop the lettuce into bite sized pieces. Put in a large salad bowl. Wash, trim and chop the tomato, cucumber, and bell pepper and add to the bowl. When eggs are done, drain them in a strainer and run cold water over the shells. When they are cool enough to handle, knock each egg lightly all over (I do this on the counter) to create small cracks all over the shell. Hold each egg under a stream of cool, running water and carefully peel the eggs. Set aside. Break the prosciutto into pieces and sprinkle them over the salad. 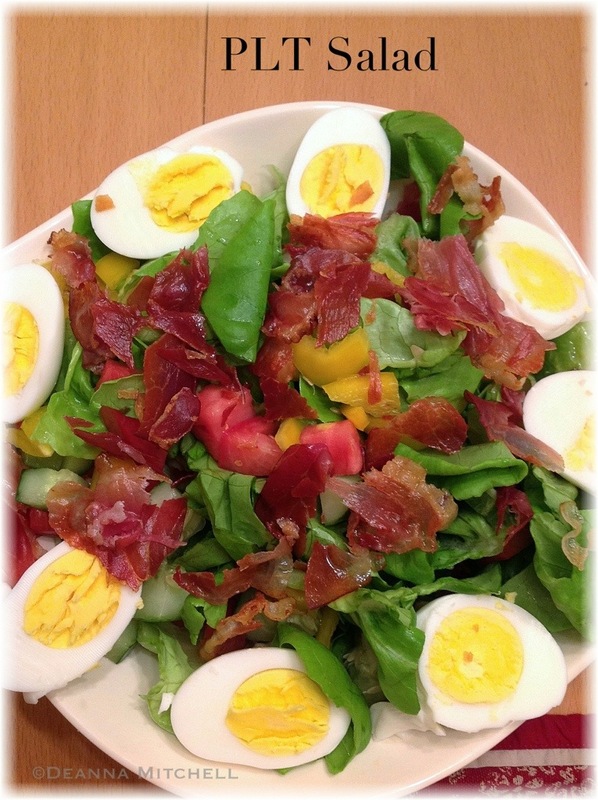 Cut each egg in half and arrange around the salad. Serve immediately with dressing of your choice!